The 'Universalis' script was 'received' (i.e. 'transmitted' by the Communicators) on 35mm Polaroid film still in its light-proof container. No camera was used so the questions posed by this psi experiment was, 'how did the script get written along the length of the film, who wrote it, and what did it mean? This film revealed a large scrawled message which seemed to read: Perfectio consummata feu quinta Essentia Universalis and there was a circle with a dot at the end. 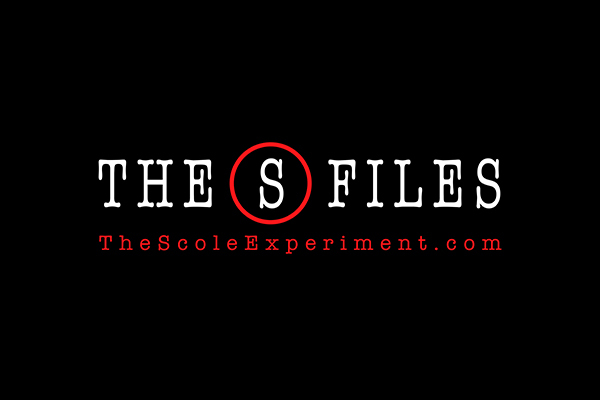 Like many of the experiments that involved the SPR during the five-years of The Scole Experiment, the text seemed to be presenting riddles that required solving. It was wondered whether, as with previous SPR cases such as the Cross-Correspondences, the Communicators were posing the riddles in an attempt to show that they were indeed 'personalities' who had survived since the riddles would be outside the knowledge or experience of the mediums involved. ​From the book, 'Magic Symbols'. ​The writing was followed by a roughly drawn circle with a dot in the centre. Professor Roy, who was present, pointed out that this was a symbol for the sun, theories about which had been mentioned in the astronomical discussion he had been having earlier with the Spirit Team. It was later found in a book, Magic Symbols (F Goodman, Trodd, 1989), which reproduces illustrations contained in a German publication of 1747, Aurea Gatena, oder eine Beschreibung von dem Ursprung der Natur und Naturlichen Dingen. This contains an illustration of the 'Golden Chain of Homer' (Aurea Catena Homeri). On this chain are attached or suspended a number of symbols, one of which has a circle with a dot in the centre and a small cross below. At the base is: Perfectio Consummata feu Quinta Essentia Universalis (From chaos to the highest summit of mankind). 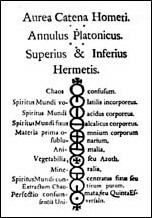 According to The Scole Report, this was translated by one adviser as above, but Dr Gauld, a member of the SPR, considered that it was better interpreted as 'completed perfection or the fifth universal essence': part of the highly symbolic device which begins the chain with chaos and confusion and ends with perfection, representing man's progress towards the light'. So, from the evidence of Magic Symbols, what the investigators had initially supposed to represent the sun was now seen more clearly to match the bottom symbol of the Aurea Catena Homeri. It might be considered worthy of note that a film with this subject matter should be received when a professor of astrophysics was present, especially since what was found to be on the film after the session pertained to discussions during the session.